My post on the Tesla/SCTY deal about the ineptitude and laziness that Lazard and Evercore brought to the valuation process did not win me any friends in the banking M&A world. Not surprisingly, it drew some pushback, not so much from bankers, but from journalists and lawyers, taking me to task for not understanding the context for these valuations. As Matt Levine notes in his Bloomberg column, where he cites my post, "a fairness opinion is not a real valuation, not a pure effort to estimate the value of a company from first principles and independent research" (Trust me. No one is setting the bar that high. I was looking for biased efforts using flawed principles and haphazard research and these valuation could not even pass that standard) and that "they (Lazard and Evercore) are just bankers; their expertise is in pitching and sourcing and negotiating and executing deals -- and in plugging in discount rates into preset spreadsheets -- not in knowing the future". (Bingo! So why are they doing these fairness opinions and charging millions of dollars for doing something that they are not good at doing? And there is a difference between knowing the future, which no one does, and estimating the future, which is the essence of valuation.) If Matt is right, the problems run deeper than the bankers in this deal, raising questions about what the purpose of a "fairness opinion" is and whether it has outlived its usefulness (assuming that it was useful at some point). What is a fairness opinion? I am not a lawyer and I don't play intend to play one here, but it is perhaps best to revert back to the legal definition of the term. In an excellent article on the topic, Steven Davidoff defines a fairness opinion as an "opinion provided by an outsider that a transaction meets a threshold level of fairness from a financial perspective". Implicit in this definition are the assumptions that the outsider is qualified to pass this judgment and that there is some reasonable standard for fairness. In corporate control transactions (acquisition, leveraged buyout etc. ), as practiced today, the fairness opinion is delivered (orally) to the board at the time of the transaction, and that presentation is usually followed by a written letter that summarizes the transaction terms and the appraiser's assumptions and attests that the price paid is "fair from a financial point of view". That certainly sounds like something we should all favor, especially in deals that have obvious conflicts of interest, such as management-led leveraged buyouts or transactions like the Tesla/Solar City deal, where the interests of Elon Musk and the rest of Tesla 's stockholders may diverge. Note that while fairness opinions have become part and parcel of most corporate control transactions, they are not required either by regulation or law. As with so much of business law, especially relating to acquisitions, the basis for fairness opinions and their surge in usage can be traced back to Delaware Court judgments. In Smith vs Van Gorkom, a 1985 case, the court ruled against the board of directors of Trans Union Corporation, who voted for a leveraged buyout, and specifically took them to task for the absence of a fairness opinion from an independent appraiser. In effect, the case carved out a safe harbor for the companies by noting that “the liability could have been avoided had the directors elicited a fairness opinion from anyone in a position to know the firm’s value”. I am sure that the judges who wrote these words did so with the best of intentions, expecting fairness opinions to become the bulwark against self-dealing in mergers and acquisitions. In the decades since, through a combination of bad banking practices, the nature of the legal process and confusion about the word "fairness", fairness opinions, in my view, have not just lost their power to protect those that they were intended to but have become a shield used by managers and boards of directors against serious questions being raised about deals. What about this process is fair, if bankers are allowed to concoct discount rates, and how is it an opinion, if the numbers are supplied by management? And who exactly is protected if the end result is a range of values so large that any price that is paid can be justified? And finally, if the contention is that the bankers were just using professional judgment, in what way is it professional to argue that Tesla will become the global economy (as Evercore is doing in its valuation)? To the extent that what you see in the Tesla/Solar City deal is more the rule than the exception, I would argue that fairness opinions are doing more harm than good. By checking off a legally required box, they have become a way in which a board of directors buy immunization against legal consequences. By providing the illusion of oversight and an independent assessment, they are making shareholders too sanguine that their rights are being protected. Finally, this is a process where the worst (and least) scrupulous appraisers, over time, will drive out the best (and most principled) ones, because managers (and boards that do their bidding) will shop around until they find someone who will attest to the fairness of their deal, no matter how unfair it is. My interest in the process is therefore as much professional, as it is personal. I believe the valuation practices that we see in many fairness opinions are horrendous and are spilling over into the other valuation practices. It is true that there are cases, where courts have been willing to challenge the "fairness" of fairness opinions, but they have been infrequent and reserved for situations where there is an egregious conflict of interest. In an unusual twist, in a recent case involving the management buyout of Dell at $13.75 by Michael Dell and Silver Lake, Delaware Vice Chancellor Travis Lester ruled that the company should have been priced at $17.62, effectively throwing out the fairness opinion backing the deal. While the good news in Chancellor Lester's ruling is that he was willing to take on fairness opinions, the bad news is that he might have picked the wrong case to make his stand and the wrong basis (that markets are short term and under price companies after they have made big investments) for challenging fairness opinions. Given that the fairness opinion, as practiced now, is more travesty than protection and an expensive one at that, the first option is to remove it from the acquisition valuation process. That will put the onus back on judges to decide whether shareholder interests are being protected in transactions. Given how difficult it is to change established legal practice, I don't think that this will happen. The second is to keep the fairness opinion and give it teeth. This will require two ingredients to work, judges that are willing to put fairness opinions to the test and punishment for those who consistently violate those fairness principles. Many judges have allowed bankers to browbeat them into accepting the unacceptable in valuation, using the argument that what they are doing is standard practice and somehow professional valuation. As someone who wanders across multiple valuation terrain, I am convinced that the valuation practices in fairness opinions are not just beyond the pale, they are unprofessional. To those judges, who would argue that they don't have the training or the tools to detect bad practices, I will make my pro bono contribution in the form of a questionnaire with flags (ranging from red for danger to green for acceptable) that may help them separate the good valuations from the bad ones. Payment is disproportionately large, relative to valuation services provided, and/or a large portion of it is contingent on deal occurring. Where are you getting the cash flows that you are using in this valuation? Appraiser estimates revenues, operating margins and cash flows, with input from management on investment and growth plans. Cash flows supplied by management/ board of company. Are the cash flows internally consistent? 1. Currency: Cash flows & discount rate are in same currency, with same inflation assumptions. 2. Claim holders: Cash flows are to equity (firm) and discount rate is cost of equity (capital). 3. Operations: Reinvestment, growth and risk assumptions matched up. No internal consistency tests run and/or DCF littered with inconsistencies, in currency and/or assumptions. What discount rate are you using in your valuation? A cost of equity (capital) that starts with a sector average and is within the bounds of what is reasonable for the sector and the market. A cost of equity (capital) that falls outside the normal range for a sector, with no credible explanation for difference. How are you applying closure in your valuation? 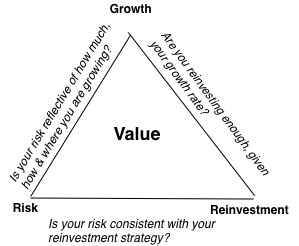 A terminal value that is estimated with a perpetual growth rate < growth rate of the economy and reinvestment & risk to match. A terminal value based upon a perpetual growth rate > economy or a multiple (of earnings or revenues) that is not consistent with a healthy, mature firm. 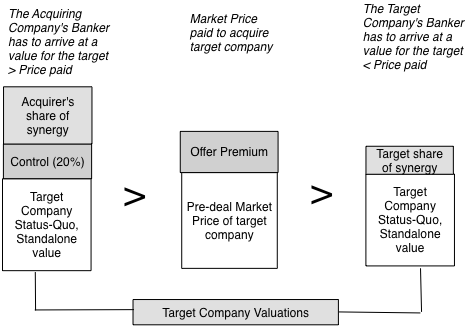 What valuation garnishes have you applied? A large dose of premiums (control, synergy etc.) pushing up value or a mess of discounts (illiquidity, small size etc.) pushing down value. What does your final judgment in value look like? A distribution of values, with a base case value and distributional statistics. A range of values so large that any price can be justified. Deal makers should not be deal analysts: It should go without saying that a deal making banker cannot be trusted to opine on the fairness of the deal, but the reason that I am saying it is that it does happen. I would go further and argue that deal makers should get entirely out of the fairness opinion business, since the banker who is asked to opine on the fairness of someone else's deal today will have to worry about his or her future deals being opined on by others. No deal-contingent fees: If bias is the biggest enemy of good valuation, there is no simpler way to introduce bias into fairness opinions than to tie appraisal fees to whether the deal goes through. I cannot think of a single good reason for this practice and lots of bad consequences. It should be banished. Valuing and Pricing: I think that appraisers should spend more time on pricing and less on valuation, since their focus is on whether the "price is fair" rather than on whether the transaction makes sense. That will require that appraisers be forced to justify their use of multiples (both in terms of the specific multiple used, as well as the value for that multiple) and their choice of comparable firms. If appraisers decide to go the valuation route, they should take ownership of the cash flows, use reasonable discount rates and not muddy up the waters with arbitrary premiums and discounts. And please, no more terminal values estimated from EBITDA multiples! Let's assume that I had been asked to opine on whether a $160 stock price is a fair one for Apple. If I had presented this valuation as a range for Apple's value from $80.81 to $415.63, my answer would have to be yes, since it falls within the range. With a distribution, though, you can see that a $160 price falls at the 92nd percentile, possible, but neither plausible, nor probable. To those who argue that this is too complex and requires more work, I would assume that this is at the minimum what you should be delivering, if you are being paid millions of dollars for an appraisal. For the appraisers: If the fairness opinion is to have any heft, the courts should reject fairness opinions that don't meet the fairness test and remove the bankers involved from the transaction, forcing them to return all fees paid. I would go further and create a Hall of Shame for those who are repeat offenders, with perhaps even a public listing of their most extreme offenses. For directors and managers: The boards of directors and the top management of the firms involved should also face sanctions, with any resulting fines or fees coming out of the pockets of directors and managers, rather than the shareholders involved. I know that your reaction to these punitive suggestions is that they will have a chilling effect on deal making. Good! I believe that much as strategists, managers and bankers like to tell us otherwise, there are more bad deals than good ones and that shareholders in companies collectively will only gain from crimping the process. As most teachers do, I mark time in academic rather than in calendar years and as September dawns, it is New Year's eve for me and a new class is set to begin. In just under a week, on September 7, 2016, I will walk into a classroom and face up to a roomful of students, not quite ready for summer to end, and start teaching, as I have every year since 1984. This semester, I will be back to teaching Valuation to MBAs at Stern, and as I have in semesters past, I invite you to join me on this journey, as we look at the mix of art, science and magic that makes valuation such a fascinating discipline. I have always believe that to teach a class well, you have to start with a story and that the class is an extended serialization of the story. I also believe that to teach well, you have to, at least over time, make that story your own and mold the class to reflect it. 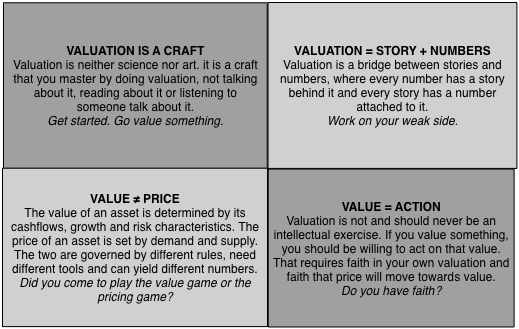 In fact, the valuation class that I will be teaching this Fall has its seeds in the very first valuation class that I taught in 1986, but the differences reflect not only how much the world has changed since then, but also how my own thinking on valuation has evolved. The class remains a work in progress, where each time I teach it, I learn something new as well as recognize how much I have left to learn. If you find this picture a little daunting, I did do a Google talk that encapsulated these themes into about an hour-long session. In particular, this class is less about the tools and techniques of valuation and more about developing a foundation that you can use to build your own investment philosophy. I know that faith is a word that is seldom used and often viewed with suspicion by many in the valuation community, but it is at the heart of this class, both in terms of how you build up faith in your own capacity to value assets and businesses and how you hold on to that faith when the market price moves away from your value. Since I still struggle on both of these fronts, I cannot give you a template for success but I will be open about my own insecurities both about my own valuations and about markets. On risk free rates, usually the least troublesome and more easily obtained input in valuation, we will talk about why risk free rates vary across currencies, what to do about currencies that have negative risk free rates and whether normalizing risk free rates (as many practitioners have taken to doing) is a good idea or a bad one. On risk premiums and discount rates, we will wrestle with questions of what risks should and should not be incorporated into discount rates and the different methods of bringing them in. In the process, we will examine how best to estimate equity risk premiums and default spreads, and why even if you don't like betas or portfolio theory, you should should still be able to estimate discount rates and do intrinsic valuation. On cash flows, we will focus on why accounting inconsistencies (on dealing with R&D, leases and other items) can lead to misstated earnings and how to fix those inconsistencies, examine what should and should not be included in reinvestment (capital expenditures and working capital) and what to do about stock based compensation. On terminal value, the big number in every DCF, that can very quickly hijack otherwise well-done valuations, we will develop simple rules for keeping the number in check and put to sleep many myths surrounding it. We will apply intrinsic valuation to value companies across the life cycle, in different sectors and across different markets. We will value small and large companies, private and public, developed and emerging and discuss how to value movie franchises (like Star Wars), phenomena (Pokemon Go) and sports teams. We will talk about why start ups can and should be valued in the face of daunting uncertainty and how probabilistic tools (simulations and decision trees) can help. About half way through the class, we will turn our attention to pricing assets/businesses, where rather than build up to a value from a company's fundamentals, we price it, based on how the market is pricing similar companies. Put simply, we will shine a light on the practice of using pricing multiples (PE, EV/EBITDA, EV/Sales) and comparable companies not with the intent of improving how it is done. We will also talk about why, even when you are careful and take care of the details, your pricing of a company can be very different form its value. 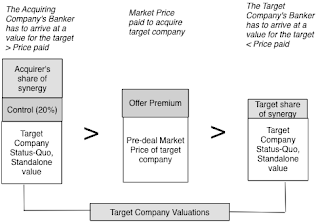 In the last segment of the class, we will stretch our valuation muscles by talking about how option pricing models can sometime be used to estimate the additional value in a business, such as undeveloped reserves for a natural resource company or expansion potential for a young growth firm, and sometimes to value equity in deeply distressed companies. We will close by looking at acquisition valuation, where good sense seems to be in short supply, and how understanding value can be critical to corporate managers. My website: The most comprehensive and most updated center of all things related to this class at this link. You will find the webcasts, lecture notes, past exams, reading and even the emails I send on this class here. iTunes U: Just as I am not an Excel Ninja, my capacity to deal with html is primitive and my website's design reflects that lack of sophistication. If you prefer more polish, you can try the iTunes U app in the Apple app store. It is a free app that you can download and install on your Apple device. Once you have it installed, click on the add course and enter the enroll code FER-SFJ-AKA. Like magic, the class should pop up on your shelf. If you don't have an Apple device, you can get to the course on your computer using this link. If you have an Android device, you can use a workaround by downloading this app first. Like all things Apple, the set up is amazing and easy to work with. YouTube: The problem with the first two choices is that they presuppose that you don't have a broadband constraint, perhaps a phone internet connection or worse. My suggestion is that you use the YouTube playlist that I have created for this class at this link. The nice thing about YouTube is that it adjusts the image quality to your connection speed. So, it should work in almost any setting. Since I have made this offer for almost 20 years now, predating the MOOC boom and bust, I can offer some suggestions. First, it is a lot of work to watch two 80-minute lectures a week, try your hand out at working through actual valuations and finish the class in fifteen weeks, if you have other things going on in your life (and who does not?). My suggestion is that you cut yourself some slack and take more time, since the materials will stay up for at least a year after the class ends. Second, watching a lecture online for almost an hour and a half can be painful and for those of you who find the pain unbearable, I do have an alternative. A couple of years ago, I created an online version of this class, shrinking each 80-minute session into 10-15 minute sessions and this class is also available on my website at this link, on iTunes U at this link and on YouTube. Third, whichever version of the class you take will stick more if you pick a company and value it and even more, if you keep doing it. I would love to tell you that I live a life of serenity and that I am sharing for noble reasons, but that would not be true. I am sharing my class for the most selfish of all reasons. I am a performer (and every teacher is) and what performer does not wish for a bigger audience? If I am going to prepare and deliver a class, would I not rather have thirty thousand people watch the class than three hundred. If you get something of value from this class, and you feel the urge to repay me, I will make the same suggestion that I did last year. Learning is one of those rare resources that is never diminished by sharing. So, please pass it on to someone else! See you in class!